Anyone who knows me knows that I love a good cocktail. The problem I find with most “modern” cocktails is that they are just too cloying, too over worked, and have far too many ingredients. I appreciate what mixologists are doing to create new and exciting drinks, but the vast majority of them fall short. I guess, in some respects, it is the same idea that my boss has tried to convey to me when I am trying to come up with new ideas for projects: put everything out there, even the ideas you know are bad, because you have to get it all out to get to the good stuff. I guess you have to come up with a lot of crappy cocktails before you create a really good one. Lately, I have taken note that the bartenders at Hearty, here in Chicago, are doing an exceptional job of coming up with excellent novel drinks, as well as great revamps of old favorites. 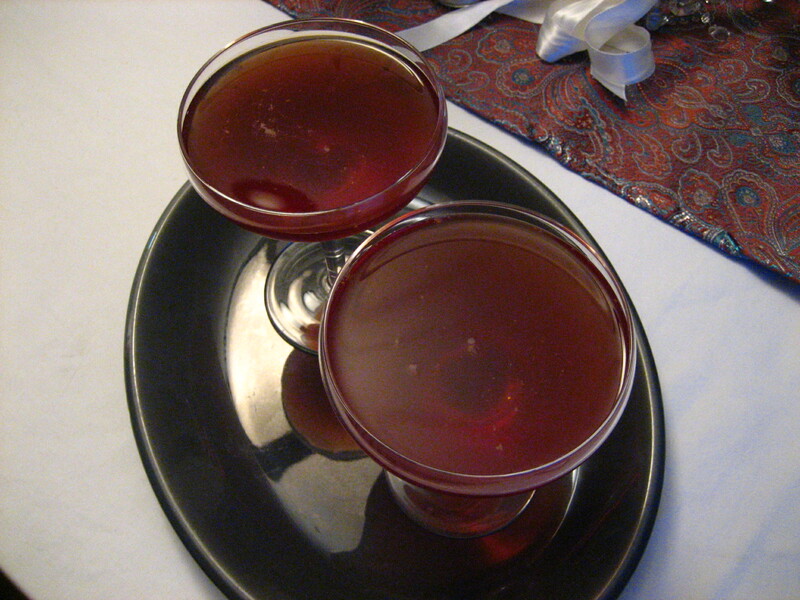 Just last night, I had their redux of the Rob Roy, with strong hints of orange that brought a great freshness to a drink that can sometimes be too old-fashioned. My companion really liked their ginger-infused take on the Negroni. Throughout my travels, I’ve visited a lot of bars with a lot of friends, and a few exceptional cocktails have stood out in my mind. One, however, has been stuck in my head for years, and I had it with my very dear friend Jennifer at the erstwhile Natasha’s in Portland, Maine. They had a clever cocktail menu devoted to single fruits, including pear, orange, and cranberry. I gravitate to anything fig-based, partly because I really like the flavor, and partly because it is my namesake. The Fig cocktail at Natasha’s was simply one of the best drinks I’ve ever had and, though it took me a long time to attempt to recreate it, I am very glad I did. Bear in mind that it takes some time to make fig-infused vodka, so you have to think ahead for this one. Fill about 1/3 of a mason jar with dried black Mission figs that you’ve cut in half (about 9); fill jar with vodka and cover. Leave at room temperature for at least a week, shaking the jar to distribute the flavor every couple of days. The vodka will take on a dark amber color and end up looking like whiskey. You can probably leave the jar indefinitely, since the alcohol acts as a preservative, but I think you’ll find the flavor a little to tempting to just let it sit there. Once your vodka is ready, put about a cup of cubed ice into a cocktail shaker and fill with fig vodka to cover. Add one of the figs from the jar to the shaker for each drink you are making. 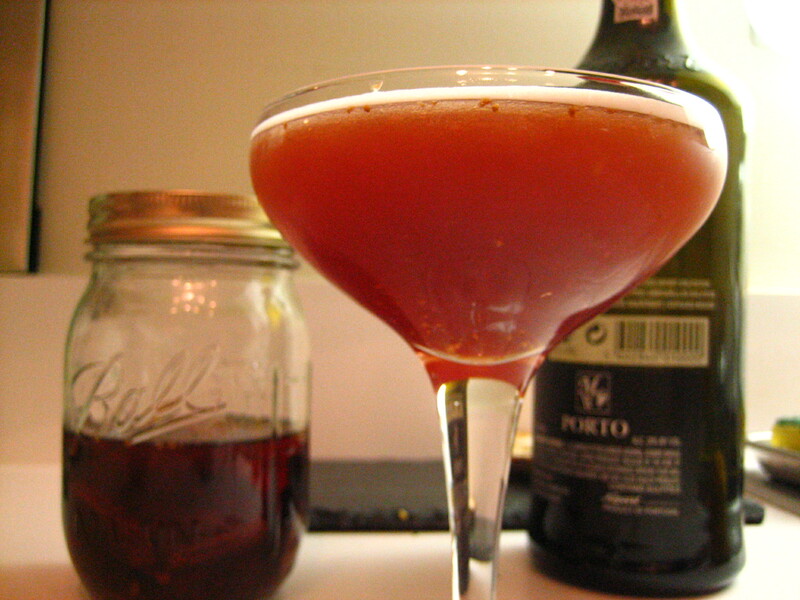 Add a few generous splashes of tawny port wine and a small squeeze of lemon, if you have a wedge available. Shake until the shaker is too cold to hold and strain into cocktail or coupe glasses. Float dry sparkling wine across the top of each glass and enjoy. It may be the perfect drink. I may be partial. oh good god. i’m putting the unpacking on hold and running out to get these ingredients…pronto. i’m salivating for the fig. at 10 am. wow. makes me want to start drinking earlier than usual! I just planted a mission fig tree in a halved wine barrel… I am looking forward to an organic homemade cocktail— thanks! Nadia, I have to tell you that I am extremely jealous of your gardens. I know the grass is always greener, but in this case, it is true of San Diego versus Chicago (at least in March)! Sounds delicious. Duncan Chase, mixologist extrordinaire at Taste in Seattle, Washington, makes a fig-infused Maker’s Mark bourbon that is also amazingly wonderful. It makes a great Manhattan. Honey, you sold me on that one!Im headed to my local (huge) farmers market to get started. Ooo, this sounds interesting. I may have to try it. Hold the phone a sec. You’ve just hit on two of my favorite things– figs and vodka. It’s like a complete meal in a tiny little glass. Bless you. Ha! Not sure if it is a complete meal, but it is a tasty way to start the evening, that is for sure. Look for the Shallots Web fan page on Facebook, if you are a user! WOW, that is going to be my new fav drink!!! oh YUMM! After a day like today, I think I’m gonna try to make this. Thanks! I am absolutely drooling at the thought of it! I need to get my hands on some figs NOW and make some!!! This sounds great. I just infused some vodkas for a party this weekend and am looking for some drink recipes in case guests don’t care for the chilled straight up approach. I have fig vodka which you’ve covered and also Black Cherry vodka and Grapefruit vodka. Anyone have any drink suggestions for those, particularly the cherry?? Thanks. I actually made some cherry-infused vodka over the summer, using sour Michigan cherries I found at a local farmer’s market here in Chicago. I’d love to know how long you let them steep – just to get an idea of how long you think is too long. I let them go for about a week before using the vodka. As for drink ideas, beyond just mixing it with soda and adding a lime – I discovered the sort of throwback taste of Cherry 7-Up when I mixed the cherry vodka with regular 7-Up. I know it sounds a little hokey and tacky, but it was delicious and I think guests love a grown-up version of a childhood soda. Another idea I just had is to mix it with a little Maraschino liqueur (for additional sweet cherry taste) and some lemon juice (for tartness), shake, and serve up in a cocktail glass. Alternatively, you could shake those together and serve over ice in a highball with a little soda. I hope these ideas help! This was my first try at infusing but I read up on it a bit and 4 days was the minimum suggested time for the cherries. It was pretty good after 4 days, so I let it go longer and it got better, longer and better… It’s been about 10 days now and I don’t know that it has changed much since the last time so I think it’s time to pull the cherries out. (Now what to do with those?!) The soda and lime is what I was thinking would work but I’ll try out your other ideas as well. Thanks. I am working on our new cocktail book and thinking about figs and aquavit. So I’m surfing the web for fig ideas and come across this link and as I start reading I find the most wonderful compliment! That made my day of research and typing feel really worth it! Hey, Steve – glad there was a silver lining in your research! I really do love the cocktails you serve at the restaurant – great balance, fine ingredients. Definitely a compliment to the delicious food served up at Hearty. I’m already looking forward to another visit. Happy mixing!